What Is an Offset Bend? 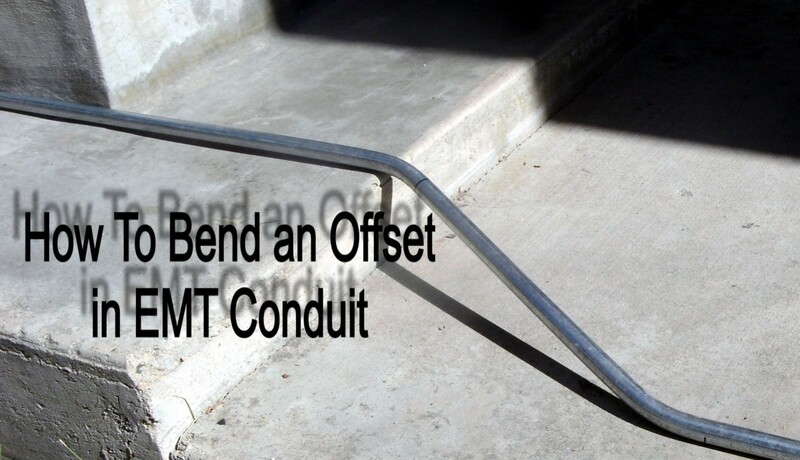 One of the more common bends made in electrical conduit is the offset bend: a technique used to move a run of conduit a set distance to one side, up or down. It is very rare that conduit can be placed in a straight line along the entire distance needed. There will usually be small projections in the way, other equipment to navigate around, or other reasons to move the conduit over some distance. While bending conduit, one of the more important things to consider is the total number of degrees of bend between pull boxes. 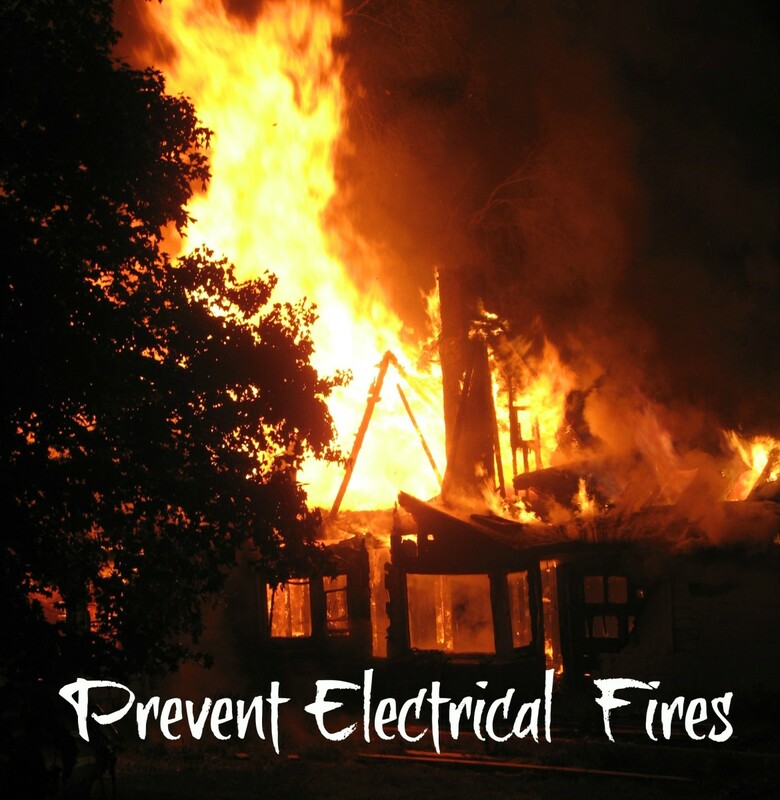 The NEC (national electric code) limits this number to 360º and some job specifications limit it even further. Fewer degrees of bend also result in an easier pull when it comes time to pull wire into the conduit—always a good thing. 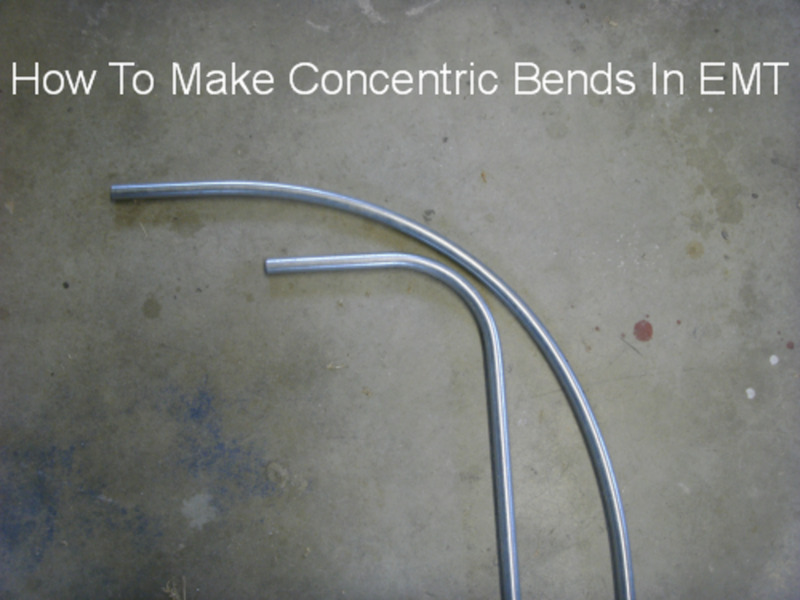 While bending an offset may be inevitable and necessary, the degree of the bend is variable depending on circumstances and the electrician doing the work. The first bend should change the direction the conduit is going. The second should reverse that direction change. The result is a rather "Z" shaped piece of conduit, as shown in the pictures below. The most common bend used is a 30º bend, followed by another of the same, resulting in a total bend of 60º, but this is not necessary in most cases. Bends of 10º, 22º, and occasionally 45º or even 60º, are marked on all hand benders and should be used when appropriate. The difference is in the multiplier, as discussed below. The multiplier is the number of the measured distance of the offset it is multiplied by to obtain the distance between the two bends. You should memorize this number for the common bends of 10, 22, 30, and 45 degrees. Many benders have the multiplier permanently stamped on the reverse side of the bender—a useful option for the beginning electrician. These numbers are also shown in the chart below. Once the offset distance is measured, multiply that measurement by the appropriate multiplier from the chart. These figures are all in decimals, though most people will use a tape measure marked in fractions of an inch. The decimals must be converted to fractions to be useful. Few electricians will try to mark and bend conduit in increments of less than 1/8" (the bending process just isn't all that accurate), so the number needs to be converted to just such a fraction. I've listed the decimal equivalents of multiples of 1/8" in the next table. You probably already recognize half of them and the other half is easily memorized. Don't be afraid to round off your numbers—1/1000" of an inch just isn't enough to worry about! For example, let's suppose that the distance needed is 3½", and that we want to use a 22º bend. The multiplier for 22º is 2.6, and 3½" is 3.5" in decimal notation. Using a calculator, we find that 2.6 times 3.5 equals 9.1". Now 9.1" is very close to 9.125" (the difference is only .025") which we can see from the chart is 9 1/8". The difference between 9.1 and 9.125 is less than 1/32". That's probably less than half the width of the sharpie line you will draw on the conduit! Don't worry about it. Just use the 9 1/8" figure. From the multiplier chart below, we can see that the multiplier for a 30º bend is exactly 2. That's why many electricians will bend nothing except 30º offsets; the math needed is simple and easy. This practice also results in unnecessarily sharp bends, harder wire pulls, and often additional junction boxes. It can also add time and money to the job and cause additional work during wire pulls. This practice is easy to avoid. Nearly everyone carries a cell phone with a calculator in it nowadays, and even if you don't you can still multiply two numbers. Do it right: Use a bend appropriate to the task. A large offset of 3 feet will probably need 45º bends, while a small one of a few inches can usually get by with 22º or even 10º bends. It is true that 10º bends can be difficult to get perfect, and that the math for 22º or 45º offsets takes a moment of effort, but neither is an excuse for shoddy workmanship. A last word on multipliers: When bending large conduit, an angle finder is generally used to measure the precise angle being bent as the angle marks used on a hand bender are not stamped onto benders for large conduit. This raises an interesting possibility: Any angle desired may be used if you know the correct multiplier. 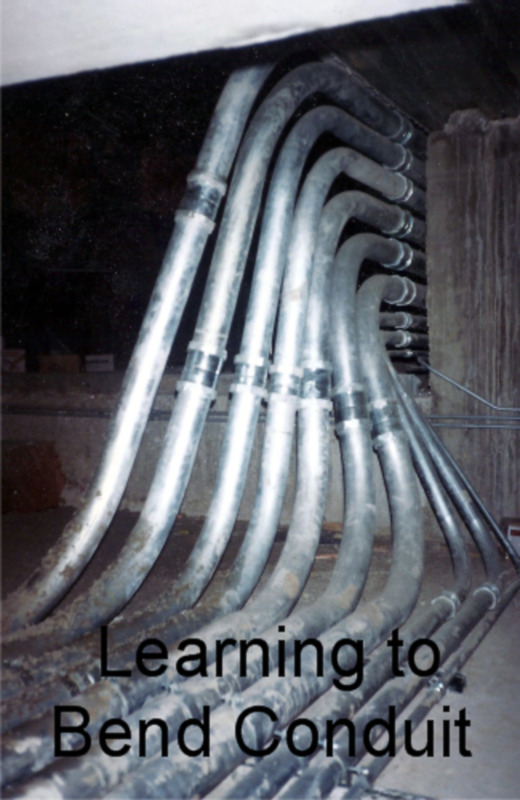 My article about the math behind bending conduit includes a description of how to find any multiplier and explains where these numbers come from. The actual bending process begins with measurements. The distance that the conduit run needs to move must be measured as closely as possible. 1. A good way to do this is by temporarily laying a conduit where the run will end, but projecting out and next to the existing run. In the photo below, the conduit coming from the right should continue, but the obstruction prevents it from doing so. The upper conduit is where the run will end up, and is laid there only to take a measurement. Measuring straight between the original, bottom, and temporary, top conduit the distance is exactly 3 1/8"
2. Measure directly from one conduit to the other at right angles. Do not attempt to take a measurement along the path the offset will take. Take the measurement straight from the bottom conduit to the top one, making sure that if the measurement starts from the bottom of one conduit it finishes at the bottom of the other. Center-to-center or top-to-top measurements are just as acceptable as long as the same point on each conduit is used. 3. In the photo, the measurement is 3 1/8". This means that the example will use a 22º bend so the calculated distance between bends is 3.125" times 2.6, which equals 8.125", or 8 1/8". The photo shows the original, bottom conduit against the obstruction. It is actually back 36" with a temporary extender added to take measurements. Mark the new conduit at 36", then again back 8 1/8" from the first mark at 27 7/8". Most offset bends are made "in the air." This means the bender is used upside down with the handle on the ground and the bending foot in the air. Insert the conduit into the bender with the 38" mark positioned at the arrow normally used to bend a 90. (You can use any mark on the bender, as long you use it for both bends. The very toe of the bender is often more convenient for offsets intended to begin close to the end of the conduit). 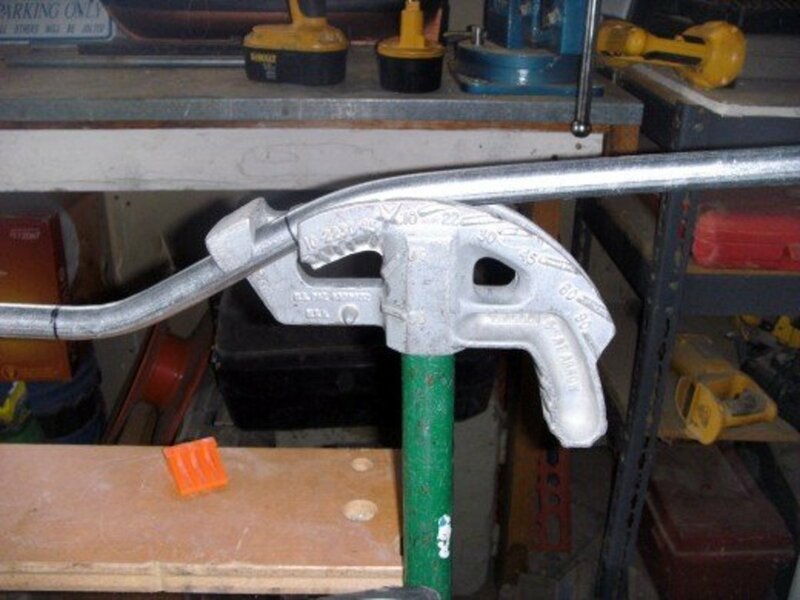 The bender handle is likely to kick out when bending in this manner. 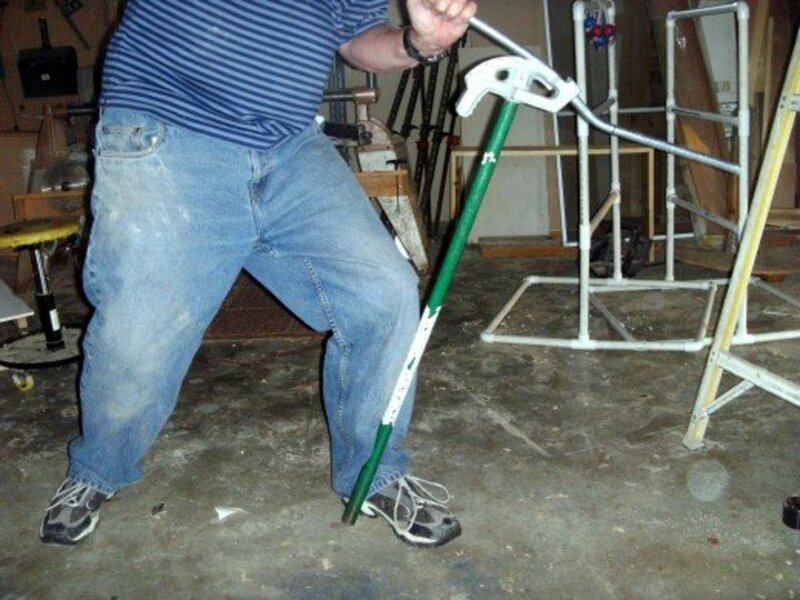 Use a foot or foot and leg to keep it in one place on the floor (see photo of the bending process). Slowly bend the conduit, keeping pressure as close to the bender as possible. Although more leverage makes it easier, be careful! If pressure is applied several feet back from the bender, it will result in an unsatisfactory bend. Bend the conduit until the it lines up with the desired mark (22º in this case) stamped onto the bender. Bending the second offset bend. Not the foot and leg position, holding the bender handle firmly in place. Rotate the conduit 180º and sight down it to make sure it is exactly 180º. Slide it forward in the bender until the second mark lines up at the same point on the bender used for the first bend, and repeat the conduit bending process. Check that the conduit is still flat. Lay it on the floor and make sure that both ends lie flat. A slight dogleg (caused by improper rotation between bends) can sometimes be worked out, but often the pipe will need to be discarded and a new one bent. At this point, the finished offset is completed a short distance from the obstruction. This is due to the shrinkage of the pipe and is inevitable when bending offsets. If this is not acceptable, the first mark should be made a few inches too far, the second (in the example) the same 8.125" back from the first mark, and the completed bend test fit, marked and cut off to fit. While it is possible to calculate the shrinkage (see the page on the math behind bending conduit) it is seldom worth the effort to do so. Completed offset, The left bending mark is barely visible on the top of the conduit, while the right mark was made clear around the conduit to make lining it up on the bender easier. 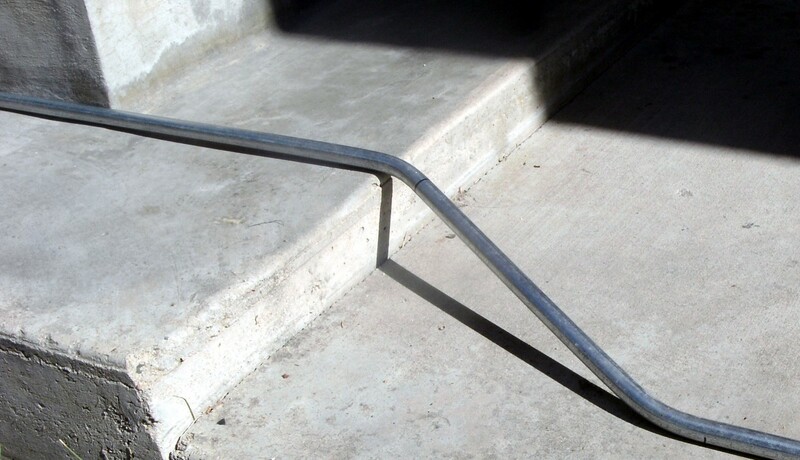 In the example above, the offset was built to angle the conduit run straight up, but what if we needed to not only go up, but to one side as well? It is possible to build two complete offset bends, one after the other, but this also results in a greater number of degrees—not a good idea unless absolutely necessary. 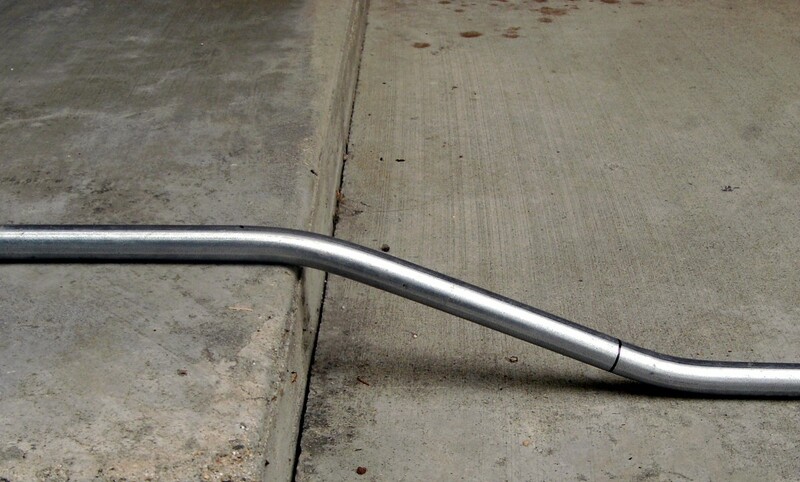 Instead, you can build a "rolling" offset, taking the conduit run both up and to the side in one bend. Learn to think three dimensionally and make your bends accomplish more than one task at a time whenever possible. A "kick 90" is another example of this, and is described on the page on bending a 90. The measurement and procedure for bending a rolling offset are identical to the method listed above, but taking the actual measurement may perhaps need a little more description. 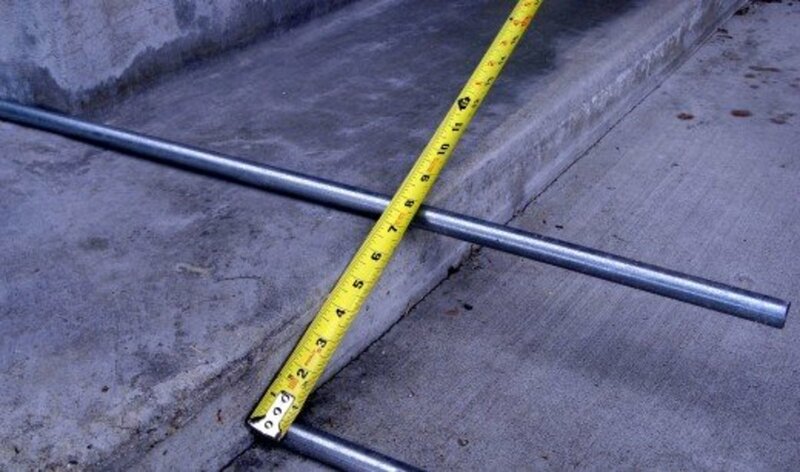 When measuring for a rolling offset, place the tape measure from one conduit to the other at right angles to the conduit. Take a measurement from a point on the first conduit to the equivalent point on the second. This usually means measuring from one side instead from the top or bottom. Make sure you don't measure from, say, the left side on one conduit to the right side on the other. This will result in an offset that is too long or too short. Measuring for a rolling offset. As an example, consider the same offset used above, except that the top conduit is moved some 6" to one side as well as 3 1/8" up. 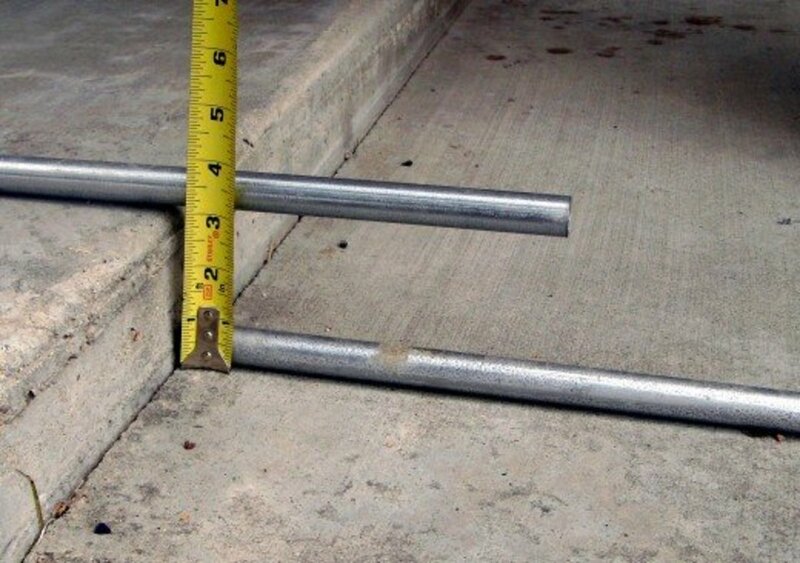 The photo above shows taking the correct measurement between the original conduit and the temporary one, and shows that the total measurement is 7¼". Note how the tape measure is hooked over the side of the bottom conduit and placed in a straight line to the second conduit regardless of the angle it might be at. With this distance, the length of the total offset when using 22º bends is a little long, so lets make this one using 30º bends. The multiplier for 30º is 2, so we need a distance of 14½" between marks. 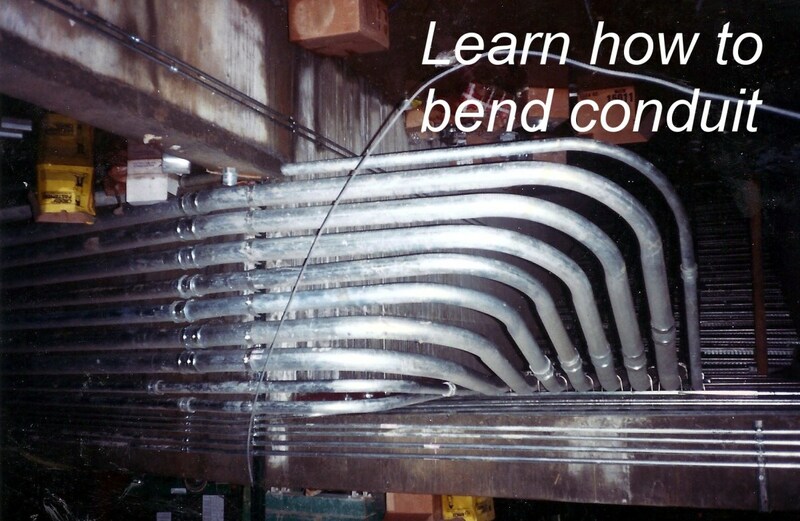 The bending procedure is also the same as in the above example and results in the pictured conduit with a long enough offset that it can be "rolled" to one side. It just fits into the corner of the second obstruction while keeping the same 3 1/8" vertical distance change. This offset contains a total of 60º of bend; compared to two 22º offsets, it saves 28º of bend and will be much easier to pull wire through. Completed rolling offset, moving both up and to the right. 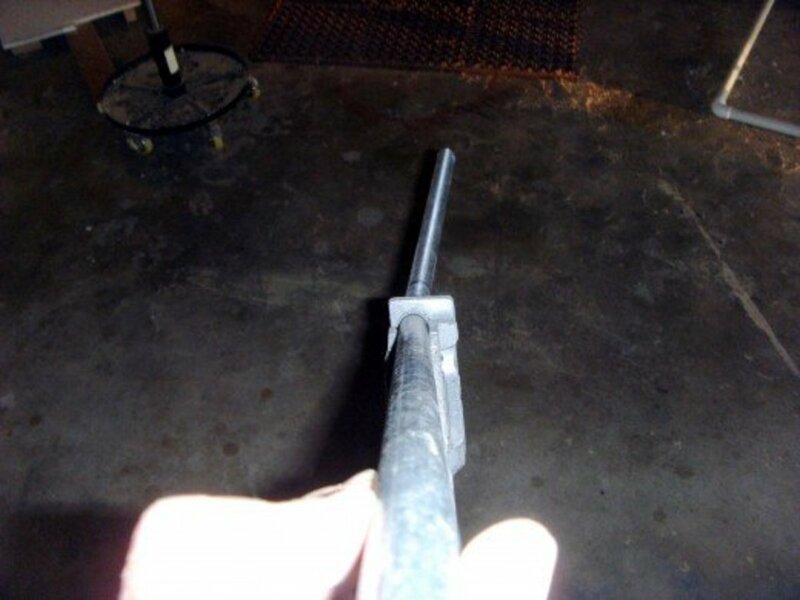 I've posted several more articles making up a conduit bending guide for electricians. This title page has a brief description of each, as well as a handful of other pages that a professional electrician may find of value. This set of articles is still a work in progress; pages will be added as they are written. If you don't find what you want, leave a comment and I will consider adding it to the set. How much will a rigid conduit with a 30 degree offset shrink? It depends on how large an offset is made of. The shrinkage is not dependent on either the type of conduit or on the size of that conduit, however. What is the maximum number of 90 degree bends permitted between junction boxes in a run of EMT ? As with any other bend, the total degrees of bend cannot exceed 360. 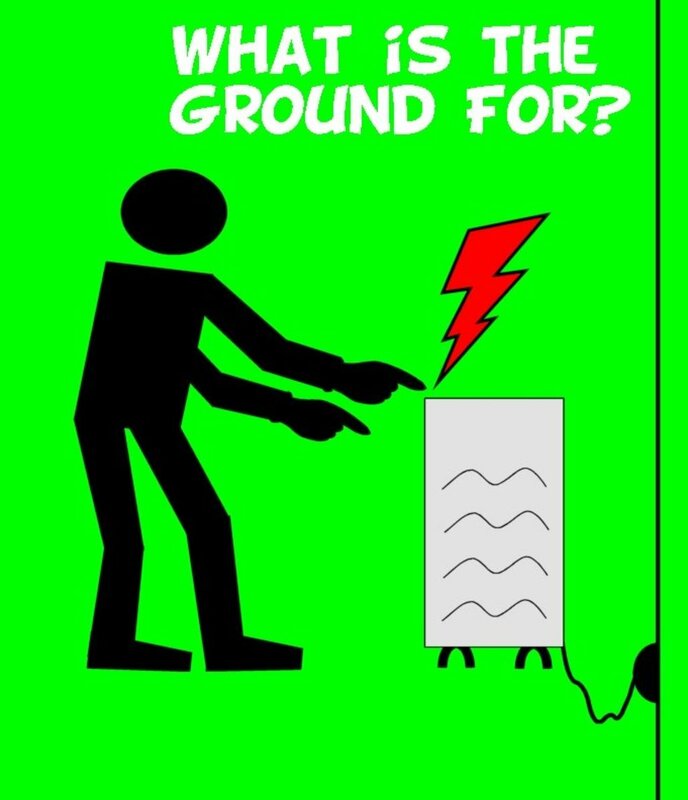 If all the bends are 90 degrees, that means the maximum number of bends between junction boxes cannot exceed 4. How do you bend small offsets like 1 inch or 1 1/2? In a smaller pipe, using a hand bender, even a 1" offset is possible using 10° bends. The marks will be 6" apart and that is quite doable. Larger pipe, like 4" conduit, becomes a guessing game though. thanks a lot , great explanations, thank you again. You're welcome, Dean. Glad you found it of value. THANKS A MILLÓN !!! Iove the trade very much, just trying to master my bending skills as a new electrician !!! You've helped.alot !! Thanks bro bra! My bender was all marked up and I forgot the multipliers. Good site dooood. Thanks, jesse, and glad you found it useful. You are certainly welcome, and I'm glad you found it useful.